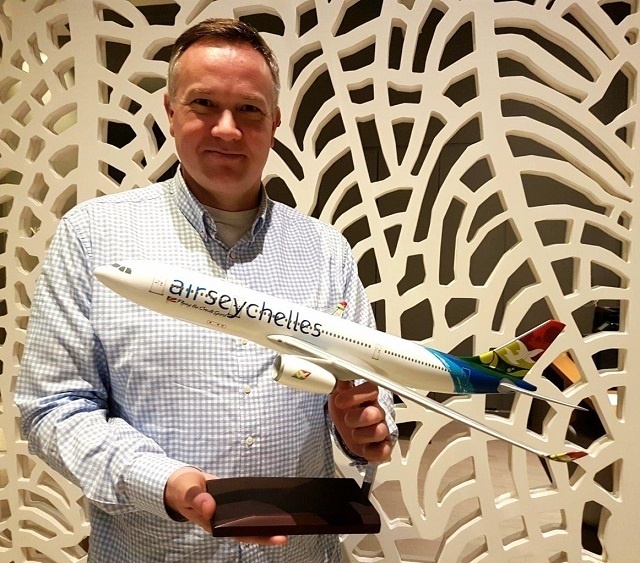 (Seychelles News Agency) - The Seychelles’ national carrier, Air Seychelles, has confirmed Remco Althuis as its chief executive after eight months as the interim CEO. The airline said on Friday that board members of both the government of Seychelles and Etihad Airways had approved the appointment of Althuis, who joined the airline in December. “We have been working with Remco for over eight months now and with his wealth of experience in the aviation industry I am confident that together with the Air Seychelles team he will continue to drive the airlines’ transformation plan forward,” said Jean Weeling – Lee, chairman of the Air Seychelles board. Althuis, 48, a citizen of the Netherlands, succeeded Irishman Roy Kinnear, who left Air Seychelles on December 31. He joined Etihad Airways in 2012 and was the regional general manager for Europe, with responsibility for the airline’s commercial activities in 17 European markets. The new CEO joined the national carrier of Seychelles, an archipelago in the western Indian Ocean, just before 2018 -- the year of transformations for the airline. “We started the year on a difficult path, with the re-organisation of the airline ensuring Air Seychelles is fit for purpose to prosper, and as a people-focused business moving forward we will continue to emphasise on the aspects of safety, innovation and sustainability to develop our business further in addition to concentrating on the arrival of the new Airbus A320neo aircraft set to be delivered mid-2019,” said Althuis. When addressing the National Assembly in March, Maurice Loustau-Lalanne, the then Minister for Tourism, Civil Aviation, Ports and Marine, said that the restructuring will allow Air Seychelles to become a sustainable company in the fiercely competitive aviation industry. The transformation included the cutting of 174 of the Air Seychelles staff and concentrating in areas where there are advantages for the airline and where profits can be made. Air Seychelles -- established in 1978 -- currently offers international flights to Abu Dhabi, Johannesburg, Mauritius and Mumbai. The airline maintains a strategic partnership with Etihad Airways, the national airline of the United Arab Emirates and 40 percent stakeholder.